I know it's been a bit quiet around here, but when an opportunity to be grown-ups for a few days presented itself... well, we just had to do it! My In-Laws kindly offered to take Our Boys for a long weekend while we escaped to Las Vegas for some fun with another couple we have been friends with for a long time. We had a fabulous time and I even managed win a little bit here and there... and then go buy souvenirs to bring back to the boys. It was my first time to Vegas and we stayed at the Venetian - a truly beautiful hotel which is such a contrast to the other hotels that are near it. 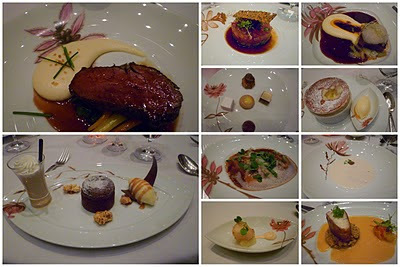 For our first night there, we started things off in style by having dinner at Hubert Keller's restaurant, Fleur de Lys. It is not a large restaurant, but it has VERY high ceiling. When you look up, you see this intimate dining area located inside the wine cellar. You can request to be seated there, if you prefer. We dined in the regular dining room, and surrendered to the Chef's Elegance Tasting Menu with wine pairing. There were many components to the meal and we sampled a bit of what each of us ordered. I will describe some of the highlights, but don't want to make this post go on for days, so I will try to summarize as much as possible. I started with the Truffled Onion Soup which can only be described as PURE COMFORT food. The creaminess of the soup kept me going back for more and it was perfectly accented by the addition of the red wine shallot puree and the braised duck crepe. I will be dreaming of this soup when the cooler weather comes back to New Jersey. My friend ordered the Stout Braised Short Ribs and, let me tell you I will find a way to make them myself! The meat was so tender it really melted in your mouth. This is something I know my whole family would enjoy. The flavor wasn't overpowering, but rather subtle. The Chorizo Wrapped Suzuki Sea Bass was a deeper, smokier dish. The chorizo added all that was needed to the sea bass for this dish to be a success. While three of us opted to order the souffles for dessert - one chocolate and two Grand Marnier, My Husband went with the Warm Chocolate Fondant Cake. While I enjoyed my souffle, I must say the cake was pure chocolate HEAVEN! It was served with Popcorn Ice Cream and a Peanut Butter Milkshake. Our waiter was very knowledgeable and explained each of our dishes thoroughly as well as the wine selections. Overall, it was the perfect way to begin our weekend away. Stay tuned as I have a couple of other dining experiences I will share from the trip as well. Wonderful dinner and wonderful company! We were so happy you could join us last weekend! You guys are the best! I will agree to the first commenter. That is a very wonderful dinner and they offer a very wonderful service. And my favorite in that diner is their amazing dish.